This eight day African adventure takes you from the hustle and bustle of Nairobi to the peace and tranquillity of the Masai Mara to ensure you get to appreciate all sides of Kenya, plus plenty more besides. 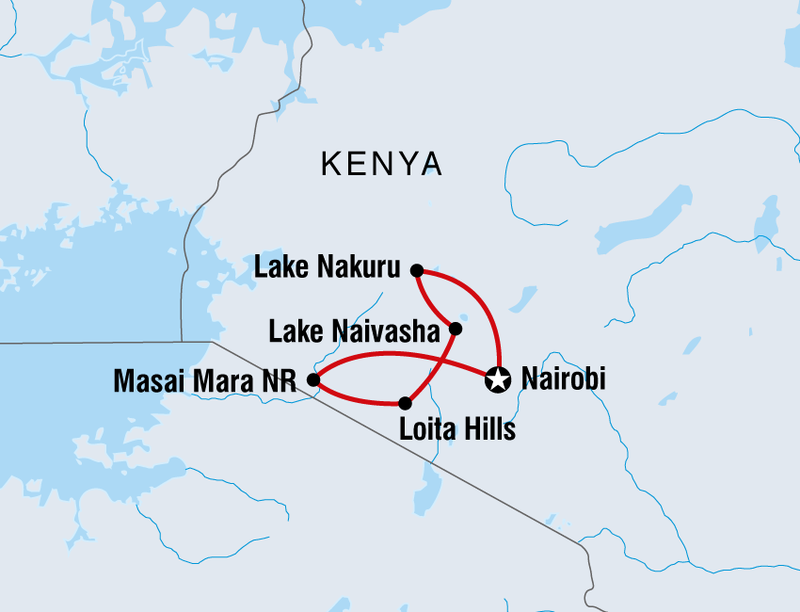 As this is a small group holiday for families (max 31 travellers) you’ll be able to make new friends along the way, with campsites on the banks of lakes Nakuru and Naivasha providing wildlife watching opportunities aplenty as well as lots of downtime moments to allow everyone to rest and relax. After you’ve all caught your breath it’s time to ramp up the excitement as you journey into the Great Rift Valley and go on game drives in the Masai Mara National Reserve. Game drives and overland travel between a couple of the locations can be lengthy so this family holiday is better suited for older kids rather than little ones. Conservation projects and meeting Masai communities further involve families with older children as well as opportunities to safely observe lions, cheetahs, zebras and rhinos in their natural environment. From tribal culture to animal protection, local authorities and NGO’s are committed to keeping Kenya just as she’s been for generations which is good news for families looking for an authentic African experience that’s all set to enthrall and inspire in equal measures. This trip allows travellers to view wildlife in their natural habitat from Lake Nakuru to the Great Rift Valley. In Nairobi we visit David Sheldricks Elephant Orphanage and the Giraffe Centre. These conservation projects allows travellers to see the animals up close while learning more about them and their plight in the modern world. 50 million bottles are used in Kenya annually, creating a monumental environmental challenge. To do our part all our overland trucks have drinking water. We encourage all our travellers to bring with them a reusable drinking bottle to ensure we aren't contributing to the plastic bottle issue in Kenya. An important part of travel is mixing with the locals and experiencing “real life” in the destination. On this trip, we stay in the remote region of Loita Hills. This is the home of the traditional Maasai people. We camp in the village where we gain an insight into the culture and ancient ways of this proud East African community. A local elder will deliver a fascinating talk about the Maasai and their history and culture. All aspects of this trip (on the ground) are operated by Kenyans (most of whom live locally) including all our leaders, vehicle drivers, local site guides, and accommodation providers. East African Wild Life Society (EAWLS) promotes the conservation and wise use of the environment and natural resources in East Africa. The tour operator's Foundation directly supports EAWLS anti-poaching programs that protect wildlife in the Masai Mara ecosystem. These anti-poaching projects rely heavily on Rangers to patrol areas where wildlife exists and all donations will go towards funding the purchase of equipment the Rangers need to carry on protecting the amazing wildlife found in the Masai Mara.